One of many sculptures, carved from snow, at the Harbin Sun Island International Snow Sculpture Art Expo in Harbin, China. How's your photography going? Are you out of sorts, feeling down. There's nothing like a walk to help set the body right. Likewise a stroll with camera in hand can really stimulate the senses. And you know what they say, "Healthy mind, healthy body". But what's to be done when our first sojourn in a while leads us out onto a not too interesting street under not particularly interesting light? Remember composition, it can save you. Photographers, like anyone else, get tired. Travel Photography, by its very nature, involves movement, excitement and the occasional dose of tedium which, if you're not careful, can be harmful to both body and soul. Changing hotels and near constant travel can sap the strength of the best of us. And don't start me on airport lounges, queues and baggage carousels. The above photo was made at around -20C while on a walk outside Harbin in far northeast China. My wonderful visit to this large, cosmopolitan city could easily have gone off the rails. It's one of the worst cities I've yet visited for downright fraud. And I'm referring to the town's infamous taxi drivers. (However, that was not my experience when visiting several of Harbin's major tourist attractions like SnowWorld or the Harbin Ice Festival. I couldn't have been treated better, particularly by the young and friendly staff at SnowWorld). But back to the taxi drivers. Getting from the airport to my hotel took around 2 hours longer than it should have and involved a tag team of 4 separate cabs and 2 hotels, other than the one in which I was booked to stay. Let's just say the tripod came out and was aired in a rather freewheeling manner before I was taken to the right hotel. This is not who I am but, as they say, desperate times call for desperate measures. Needless to say your own experience with the taxi drivers of Harbin may have been totally different to my own. I hope it was and perhaps things have changed since my visit. All I know is that you can't buy goodwill, you have to earn it. I sincerely hope that local leaders have joined with law enforcement and cracked down on the forms of abuse folks like me have suffered from the Taxi drivers of Harbin. Man made channels in the snow, beyond the normal tourist route at the fabulous Snowworld in the city of Harbin in far north east China. On another day I had enormous trouble getting back from one of the cities premier attractions on the edge of town. I walked some distance to reach a large bunch of taxis, all parked together. It's the kind of place where you have to barter to set a price, prior to embarking on your trip. The drivers didn't seem all that interested in me until one of them, a woman, approached me with considerable swagger and, through gestures assured me that she knew where I was going and could get me there. She proceeded to lead me over to her car from where she immediately made a call. After that we sat, without moving for around 10 minutes. Needless to say I was getting suspicious by this stage and gestured to her to get a wriggle on. After making another call she proceeded to turn the ignition on, release the handbrake and drive me around the car park, without getting out of first gear. Clearly she couldn't drive and it was apparent that she was minding the car for the driver. I couldn't help but get frustrated at this turn of events. It was around -20 degrees Celsius and I had to get back to my hotel as I had some commitments I had to meet before heading out for a night photography session at temperatures of around -30 Celsius. After considerable agitation on my behalf we took off once again. I was relieved when we left the carpark, but not for long as, still in first gear, my driver took me on a tour of nearby side streets so as to avoid the highway into town. After about another five minutes of this nonsense I opened both back doors of the taxi causing her to stop. I then got out of the cab and walked off to find my own way back into town. It was a considerable distance but I was prepared to try my luck. A stand of trees in the snow near Harbin, China. While on this little walk I felt the need to keep calm. Out came the camera and a few quick pics were made, without the driver noticing, that contrasted the smooth and textured areas of snow and the lines evident in the stand of trees. Not a great photo, but a good way to calm my mood, remind myself why I'd come to this remote part of the world and clear my head so as to be better able to resolve the issue. Getting out of the cab and going for a walk did enough to unsettle and embarrass my driver to finally act. Remember this is Asia and a loss of face can be deeply unsettling for the person involved. This time she made another call and it was obvious she was pushing hard to get the matter resolved. A few minutes later another taxi arrived and I was taken directly back to my hotel. What a relief! An exterior view of St. Sophia Cathedral in Harbin, China. I now have a good working knowledge of Harbin and it's amazing winter attractions. I love it and, by the end of this exploratory adventure, have the contacts to be able to include the city of Harbin in a photography tour. And because I've done the preliminary work, and suffered for my efforts, none of my customers need experience these more negative affects of travel photography. Given the choice I always prefer to visit a place first, so as to know the best times and locations for photography, before I'd consider bringing paying customers there. This also gives me the opportunity to build up the necessary working relationships with local folk that make all the difference to making the tour that much more special for those participating. A world of ice, illuminated by artificial light at -20 degrees Celcius, at the spectacular Harbin Ice and Snow Sculpture Festival in Harbin, China. When I went out later that evening I organized a driver and car with my hotel. And I paid extra to ensure that he stayed there as long as I did. I had a blast, no pun intended, wandering around in -30 Degree Celsius conditions making photos such as the one directly above. I wore a balaclava to protect my face from the biting cold and wrapped my camera in a fleece beanie which I also used, about every two minutes, two wipe newly formed ice off my camera. The beanie kept my camera warm and, after a three hour photography session, there was still plenty of juice in the battery. At closing time I headed back out into the carpark to see my driver, huddled with other drivers around a 44 gallon drum in which a fire had been made. He got me back to my hotel directly and without incident, so I tipped him generously. I then walked across the road to a local convenience store and asked for an ice cream. The shopkeeper pointed to the door. I thought he'd misunderstood me, but then I realized that, in this climate, there's no need for a freezer. Boxes of ice cream were laid out on the footpath. I grabbed a couple, paid the shopkeeper and headed back to my hotel. What a fun and bizarre way to finish an equally bizarre day. 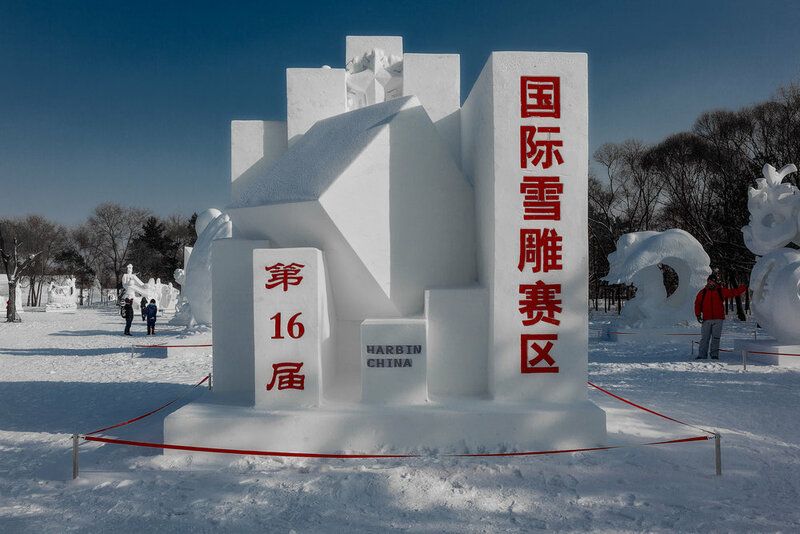 If you're traveling on your own to Harbin for the fabulous Ice and Snow Festival my advice would be to prebook your accommodation and make arrangements for a car or hotel minibus to take you to and from the airport. Likewise, consider hiring a car through your hotel to get you to various locations around the city without too much trouble. Harbin is a beautiful city, being once a part of Russia, and its winter attractions provide the enthusiastic photographer with many great opportunities for photos.